competent can apply online from upnrhm.gov.in. The candidates who apply for these jobs will be selected through written examination and interview. 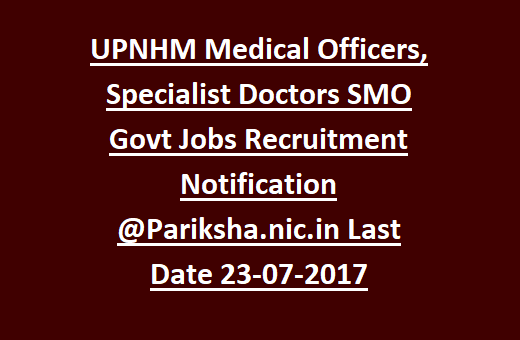 The last date to submit the application form for UPNHM SMO Jobs is 23-07-2017. There are various categories in the UPNHM Recruitment for Govt Jobs. The application fee for the Jobs of UPNHM is Rs. 100 for General and Rs. 50 for reserved. For more details and further information regarding educational qualification, age limit, pay scale, available vacancies, selection procedure and applying process about Medical Officers, Doctors and Specialist Jobs go through the information given below. The minimum educational qualification for the job of Medical Officer is M.B.B.S in their respective field. However, the Specialist or SMO requires PhD in specialization. The surgeon may require MS- surgeon in specific. There is no specified age limit for UPNHM MO and SMO Jobs. The official notification did not specify any restrictions regarding age criteria. The candidate selected and appointed will receive a monthly honorarium of minimum Rs. 60,000. It may increase based on the designation and category. The candidates who are willing to apply for UPNHM MO Jobs shall pay an application fee of Rs. 100. However, a relaxation of Rs. 50 is provided for reserved candidates. The applied candidates may have to attend the written examination and called for Interview. For more details refer official notification. The interested and eligible candidates may apply from the official website by paying the application fee. After filling the application form, send the hard copy to the address mentioned in the official notification. For further information and more details about NRHM Medical Officer, Specialist and Doctor Jobs refer the official notification.